Hone Your Skills - the4pointer.com | Real Hunts. Unreal Stories. People often ask me for my advice on what I feel is the best way to begin a practice session on the backyard archery range. Actually, that’s not true. No one has ever asked me that. I just wanted to sound like one of the real writers that frequent the popular hunting magazines. But don’t be fooled! Just because I am not “one of them” I am still willing to share with you the single most important tip to begin a practice session that you have ever heard. Ready for this? Begin your session by shooting three shots from the furthest distance you feel comfortable shooting. It sets the tone – Nothing will force you to focus more than a long shot. It’s easy to take 20 yard shots lightly because they are fairly effortless but not so with long ones. Starting long will compel you to take your practice session seriously right off the bat. It’s a good judge – You’re arm will never be more rested then at the beginning of a shoot and long shots provide a great indicator of how tuned in you are. If you save the longest shots for last your arm will be tired which will make it that much more difficult to hold steady when it matters the most. Tired arms can lead to poor shots and bad habits. The stronger you feel, the longer you’ll be able to hold on the target and focus on your form. That’s important. It’s a confidence booster – Shooting a tight group from your maximum distance is a great way to begin a session because it will boost your confidence right from the start and it will make the shorter shots seem that much easier. A couple of years ago I was shooting 2 -3 times every week all summer long. For me that was the most I’d ever shot and I was good. As a result, I began to push myself to new limits and began shooting from 90 yards. I would have gone further but I’d have been standing in the middle of a busy highway at that point and it didn’t seem worth it to die during a practice shoot. After 1 or 2 shots from 20 yards to warm up my arm I’d step back to 90 yards and fire off a few. 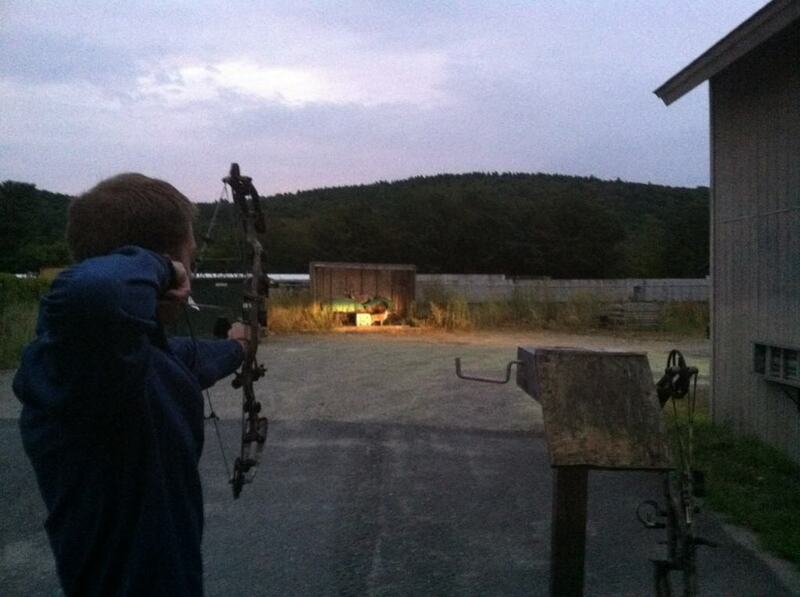 Watching those arrows drop in on a little black bear target was fun and a great confidence booster. After that the 50 yard shots seemed like a chip shots! I found it a great way to practice and recommend you give it a try. I wouldn’t advise taking a 90 yard shot on a deer, though. Too much can go wrong. I may not be an expert but I’ll at least tell you what works for me. Maybe it will work for you too!